Another mid-range beast is here, this time from the latest brand, Realme. Realme launched its first phone in May this year and it all started from there. The expectations were high and they didn't disappoint us at all. 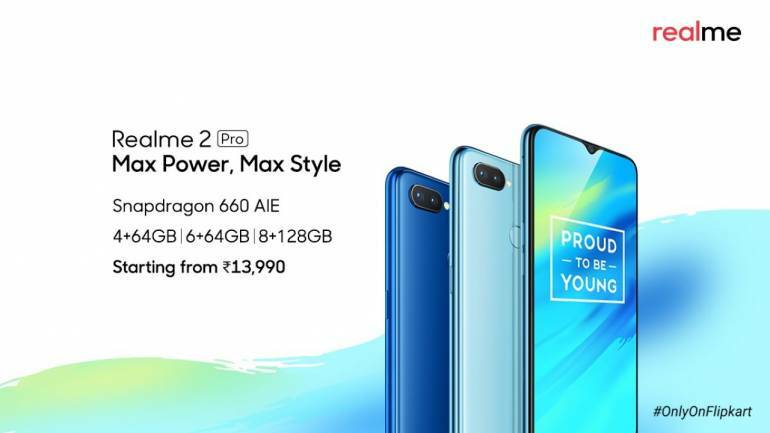 Their latest launch, the Realme 2 Pro is the example of how a mid-range phone should be. So let's have a look on its specs and price. The Realme 2 Pro comes with a polycarbonate body like its predecessors but this time with a beautiful glossy finish, unlike the predecessors' diamond cut one. The display is bigger with 6.3" screen holding 1080x2340 resolution. The display has a 19.5:9 aspect ratio with 407 PPI pixel density. It has the Corning Gorilla Glass 3 protection on it. The display holds a tiny notch at top for the selfie camera and sensors. This is called a dewdrop notch by the brand. It is also the cheapest phone to come with this type of notch. The Realme 2 here comes with its most attractive feature according to the price. The Realme 2 Pro has the underclocked Snapdragon 660 AIE chipset in it and it gains 1.96 GHz clock speed in Geekbench. The real sd660 has 2.2 GHz clock speed. It also has the Adreno 512 GPU for a smooth gaming experience. In the software section, it has Android 8.1 out of the box and the Color OS 5.2 skin on it. This skin is a little buggy according to the users. Hope Realme optimize it well. The Realme 2 has decent cameras looking at the competitors. It has a 16+2 MP dual camera module on the rear side with AI capabilities. The primary one has the aperture of f/1.7 and the secondary camera works as the depth sensor. In the front side, it has a 16 MP selfie shooter with f/2.0 aperture. The camera looks good on paper but obviously needs a look to be confirmed. If we leave the Asus Zenfone Max Pro M1, this phone gives the lowest priced 6/64 ram and storage option with a Snapdragon processor. Some brands provide the 4 GB version with the sd636 in the price rate of its 6 GB variant. The phone is also the cheapest 8 GB ram phone in the market till now. It has three variants with 4/64, 6/64 and 8/128 GB of ram and storage options. They are priced at 13,990/-, 15,990/- and 17,990/- INR respectively. The Realme 2 Pro also has three attractive colour variants consumers would love to see between their hands. The three colour variants you get are Black, Deep Blue, and Light Blue. The Realme 2 comes with a 3500 maH battery which looks average and it can survive for almost a whole day without charging. The all other features are available like Wi-Fi 802.11 а/b/g/n/ac, dual-band, WiFi Direct, hotspot, Bluetooth 5.0, fingerprint sensor, micro USB port etc. The device doesn't have the fast charging support for now. Hope the brand can do something from their side for this after the sale starts. Overall the Realme 2 Pro is a good mid ranger with mixed specs and pretty low pricing. But also you have to compromise with some features that other brands are providing. And also we will wait for other devices by the brand to be better than this.